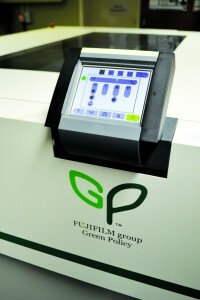 August saw the installation of a Fuji ZAK low chemistry plate processor. The revolutionary intelligent processor design greatly improves plate production and quality as a result of a more tightly monitored processing environment, this tighter environment has many advantages. The chemistry bath life is extended from 1 month to 3, extending the life of the bath chemistry and so reducing waste. The replenisher rate is also greatly reduced meaning that less developer is needed for each plate that goes through. We calculate that these benefits will mean an 84% reduction in our developer use compared to our old system. In addition to the processor we have also installed a waste reduction system; this system takes the waste developer from the plate making process and concentrates it down by separating out the water content. This reduces the volume of waste from the plate making process with the added benefit that the distilled water can then be re-used in the plate processor reducing water consumption. If you would like any more information on this or any other environmental issue please contact Adrian Quantrill.